Hussard de Chamboran by Henri Félix Philippoteaux. 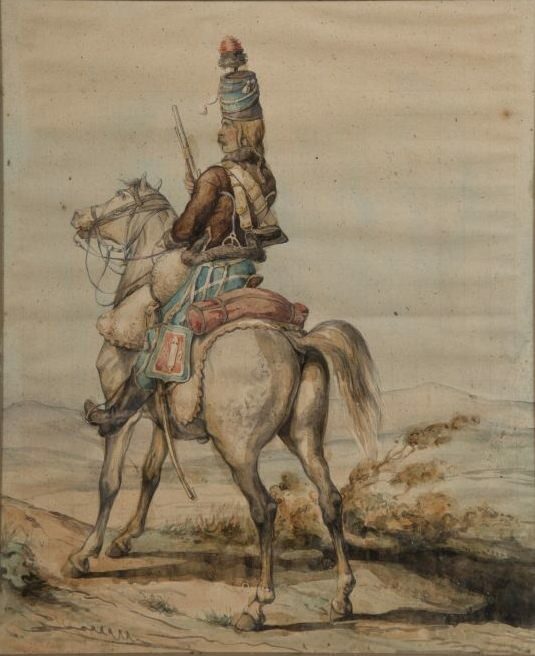 Pierre Viriot joined the Chamboran hussars in 1791. Pierre Viriot was a promising French soldier who wound up on the bad side of both the Napoleonic and the Bourbon regimes. His career was undone by his honourable involvement in the trial of the presumed kidnappers of French Senator Clément de Ris. Viriot’s sad tale shows the power of Napoleon’s police to ruin a man’s life. Pierre François Viriot was born on September 20, 1773 in Nancy, in northeastern France. His father, also called Pierre, had distinguished himself as a soldier in the Seven Years’ War. His mother, Jeanne Françoise Lemaure (or Lemort), gave birth to at least 11 children and was particularly long-lived, dying at the age of 95 (or 101) in 1827. At age 15 Viriot entered a military training school at Pont-à-Mousson. At age 17, in January 1791, he enlisted in a regiment of hussars at Chamboran. After two campaigns in the Moselle, Viriot was sent to the Vendée, in the west of France. He fought against the royalists known as Chouans. In 1793, he married Marie-Françoise-Constance Calonne. They had four sons. By the fall of 1800, Pierre Viriot, then age 27, was a captain of hussars. He bore the scars of 14 wounds – five from swords and nine from firearms. One of them had taken out his right eye. He might have gone on to a distinguished career in the Grande Armée. Instead, a temporary appointment forever scarred his life. Viriot was named to a court charged with judging the presumed kidnappers of French Senator Dominique Clément de Ris. On September 23, 1800, Clément de Ris had been robbed and abducted from his home, the Château de Beauvais, near Azay-sur-Cher, in full view of his wife and servants. The brigands imprisoned him in a cave for 17 days. They then set him free in a clearing, from which he returned home. First Consul Napoleon Bonaparte, who had appointed Clément de Ris to the Senate, instructed the Minister of Police, Joseph Fouché, to find the guilty parties. Unbeknownst to Napoleon, Fouché had arranged the kidnapping himself. Hoping that Napoleon would be defeated in the war against the Austrians, Fouché had been conspiring with French Foreign Minister Talleyrand and others to remove the First Consul from power. Clément de Ris had been promised a place in the new government, and Fouché had engaged in a long correspondence with him on the subject. This left Clément de Ris in possession of documents that could seriously compromise Fouché once Napoleon returned victorious from the Battle of Marengo (June 14, 1800). Fouché staged the kidnapping as a cover to retrieve the papers. Having paid off his thugs, Fouché needed to find scapegoats to appease Napoleon. Ten people were arrested and charged. A special court at Tours recommended the death penalty for former royal army officers Davin Mauduisson, Nicolas Canchy and Étienne Gaudin. All of the accused had strong alibis. They begged to confront Clément de Ris directly, but the senator had made a profitable reconciliation with Fouché and deemed it beneath his dignity to appear at the trial. Viriot disagreed. He wrote a series of notes pointing out the solidity of the men’s alibis and inconsistencies in the witnesses’ testimony. He rode to Paris to plead the cause of the accused before the government. Viriot met with Josephine Bonaparte, the Minister of Justice, and Generals Mortier and Junot, all to no avail. By the time he returned to Angers, the three men were dead. The verdict had been given on November 2, 1801. The execution took place the following day. In February 1802 Pierre Viriot received notice that, by order of the Consuls, he had been dismissed from the army. He obtained an audience with Napoleon, who asked him why he hadn’t agreed with his fellow judges’ opinion. Viriot’s chance came in January 1814. France was on the point of being invaded by the Sixth Coalition, and the threatened departments were authorized to raise volunteer corps of guerrilla sharpshooters. Pierre Viriot was named a colonel of the force organized in the Meurthe. He distinguished himself harassing allied convoys as they moved towards Paris. After Napoleon abdicated and Louis XVIII ascended the throne, Pierre Viriot was put in command of a depot at Metz that coordinated the return of soldiers arriving from enemy prisons. However, an ordinance of January 1815 put on half-pay all the officers who did not have a letter of employment from the Ministry of War (see my post about demi-soldes). This included Viriot. When Napoleon escaped from Elba and returned to France in March of 1815, Pierre Viriot offered his service to the Emperor. He was authorized to raise a corps of 1,000 infantry and 300 cavalry in the departments of Meuse, Moselle, Meurthe and Vosges. After Napoleon’s defeat at the Battle of Waterloo and the restoration of the Bourbons to power, Viriot’s corps was disbanded. He was given another position, but held it only until September 1815, when he was arrested and imprisoned on suspicion of being “author, leader, and accomplice of a plot to unite armed bands to fall openly on the rear-guard of the enemy’s troops, when evacuating French territory, and pillage their baggage and treasure.” (4) One of Fouché’s agents may have set him up. In August 1816, Viriot was condemned to 10 years of banishment followed by 10 years of police supervision. On appeal, in January 1817, the banishment was reduced to six months’ imprisonment. intriguer, who has long been away from the army, and who has been clever enough to pass off the shooting accident which deprived him of his right eye as a wound received in war; one of those people who hang on to all parties and use all events for their own advantage. In 1820 Pierre Viriot was arrested on suspicion of being involved in the August 19th “French Bazaar” conspiracy, an alleged military plot to overthrow the government. He was acquitted by the Court of Peers. By then he may have accepted the sordid role of informant to the royalist police. Perhaps the regime enticed him with the prospect of future reintegration. Or cooperation may have been the price of having his 1816 sentence reduced. (6) Viriot would have been of some value as a spy, as he still retained friendships with his Bonapartist colleagues, and was also in contact with the Marquis de Lafayette. It is during this period that we find him among the demi-soldes plotting with General Piat in Napoleon in America. It is to the king of the French, to the citizen king, that I address myself to obtain reparation for long and numerous injustices suffered for the cause of liberty and my country. I can still devote many years of service to my country; I ask to be returned to activity. Viriot then offered a defence of his actions in the Clément de Ris trial. His request for reinstatement was denied. In 1831, Viriot offered to raise a French corps to go the aid of Belgium, whose revolution was under threat by Holland. He was told this was not needed. In 1848, he begged to be put on half-pay. Since he had been deprived of his rank, he had received neither pay nor pension. In 1851 he petitioned French President Louis-Napoléon (Napoleon’s nephew, who became Napoleon III), but received no reply. Viriot moved from Nanterre to Livry, where he lived in a cottage in the woods with his wife, who had stuck with him through all his trials. Pierre Viriot died at Livry on June 10, 1860 at the age of 86. For more about the kidnapping of Senator Clément de Ris, see Paul Davenport’s Discovering France blog. Honoré de Balzac’s novel Une ténébreuse affaire (A Murky Business) was inspired by the affair. Frederic Lees, Romances of the French Revolution, Vol. 1 (London, 1908), p. 349. Germain Sarrut and B. Saint-Edme, Biographie des hommes du jour, Vol. 6 (Paris, 1841), p. 90. Romances of the French Revolution, p. 352. Jean-Marie Thiébaud and Gérard Tissot-Robbe, Les Corps Francs de 1814 et 1815 (Paris, 2011), p. 445. Biographie des hommes du jour, Vol. 6, p. 99. Romances of the French Revolution, p. 361. It is in the power of any police or Secret Service – at all times and anywhere – to ruin a man’s life. Including democracies. Fouche was a dangerous man and, together with Talleyrand, often manipulated Napoleon into situations, for which Napoleon was then given the full blame. He is supposed to have said, at Saint Helena, that he should have had both of them executed. Very true, Irene, and Fouché was certainly the guilty party in Viriot’s situation. 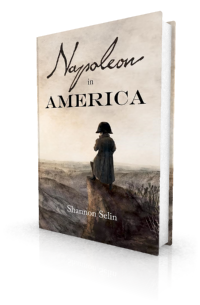 I agree that both Talleyrand and Fouche were two of Napoleon’s mistakes–he believed he could control them and found, too late, that he couldn’t, possibly because he thought they actually had moral consciences to some degree. With regard to Viriot, it seems to me that his primary interest was his personal welfare, along with his family’s welfare. After what may well have been real moral dismay, if not outrage, at the Clement de Ris trial, and having suffered for it, it appears that he spent the rest of his life trying to find someone, anyone, who would reinstate him in some capacity. You’re correct that Fouche ruined him initially, but after Fouche fell from both power and favor, surely the original facts were known? Odd that Viriot never prevailed. I found that odd too, Margaret. If nothing else, one would think Viriot could have been reinstated under Louis-Philippe. The factors weighing against him were apparently: 1) Fouché had ensured that there was damaging information left in Viriot’s file, which led effectively to a “case closed” label that no subsequent official wanted to bother unpicking; 2) the Bourbons found Viriot useful as an informant and — given his links to the opposition — felt they wouldn’t be able to trust him in active service (also perhaps Viriot had some degree of culpability in the anti-Bourbon plots); and 3) by the time Louis-Philippe came to power, Viriot was considered too old for active service. As the execution of Clément de Ris’s alleged kidnappers happened despite Viriot’s plea to Josephine et al., it was difficult for Napoleon to publicly show favour to Viriot even if he later learned the truth about Fouché’s involvement – thus the “under the radar” means of giving Viriot military jobs without officially reinstating him. Amazing story. Must have had a strong character to survive the hardships until 86. We see horror stories like this in our times. Fortunately, with internet there are no more secrets. Anybody can make it in the stock market, if they don’t do stupid things. I cannot say what means of seduction were used with my colleagues, what offers and what threats were made; … examples of corruption are unfortunately too frequent. Strong in my conviction, I refused to sign the iniquitous verdict.